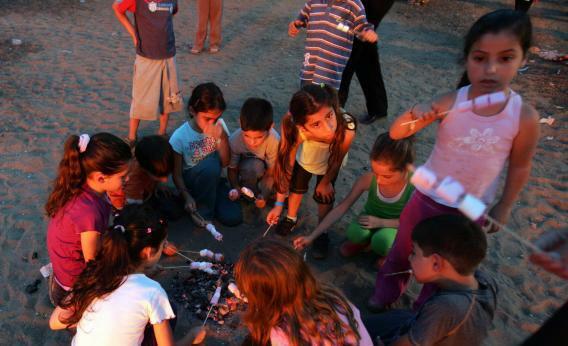 Israeli children roasting marshmallows. How fast will they eat them? Most of the kids lasted less than three minutes, on average. But about 30 percent waited 15 minutes for the researcher to come back and give them their second marshmallow. “These kids wrestled with temptation but found a way to resist,” Lehrer writes. And over the years, it has turned out that the kids who knew how to delay gratification at age 4 tended toward higher SAT scores and social competence. As a group, they were better at planning and handling stress. And now a new study shows that all the way into adulthood, they are also less likely to be overweight or obese. Tanya Schlam at the University of Wisconsin School of Medicine and Public Health and colleagues followed up with the former preschoolers, who are now in their 30s. Schlam (whom I know) found that each minute that the subjects delayed gratification as children predicted a 0.2 point decrease in their current body mass index. “Although the effect was not particularly large, the presence of any effect three decades later is noteworthy,” she argues. That’s especially true because other research suggests kids can be taught to delay gratification. “Some educational approaches (like Montessori) focus on teaching kids self-control and have high expectations for self-regulation from an early age so kids get lots of practice and improve over time,” Schlam explained in an email. Schlam points out that the best route to self-control is to avoid having to exercise it: to stay away from trays of marshmallows and cookies. But since we live in a world of too much food, it’s a comfort to know that we can teach kids to hold back on their own. Even kids whose reason for delaying gratification is that they want a second marshmallow.